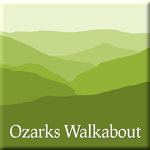 We started Ozarks Walkabout to bring into one place the information we’ve found about camping, hiking, backpacking and paddling so that you can get out and about too. It’s our way of sharing what we’ve found, and hopefully we’ll also encourage you to get out there and enjoy all the natural beauty waiting to be enjoyed. To keep up to date you can follow us on Facebook or sign up using the small form on the right there and we’ll send you an email when we add a new post. You can also ask us a question or send us a suggestion using our Contact Us form. We’re thrilled with our MSR Mutha Hubba tent. Excellent quality, easy to set up, great performance. Ginger and Gary during a spring break backpacking trip on the Berryman Trail. Bluffs on the North Fork River. We watched one Jon boat and a canoe go down the river – four people, the only people we’d seen so far. On the ridge of the Devil’s Backbone – the drop off is very steep on either side. Sitting round the campfire in Mary Hollow. Bluff on Jacks Fork river the Ozark National Scenic Riverway. Dash & Leslie and Tom & Rebbie fishing at one of the many pools on Jacks Fork river, the Ozark National Scenic Riverway. Dry run for our new tent in the front yard. Mutha Hubba tent camped at Rock Pile Mountain Wilderness, Missouri. You can fit this tent into some tight places. Gary, all snuggled up in his Montbell Super Spiral Down Hugger #0 sleeping bag. We camped a little close to the van, but it was the highest – and therefore driest spot around. between the Berryman Trail head and Edward Beecher Recreation Area. These were fairly typical conditions for the higher parts on this section of the trail. Between the Berryman Trailhead and Edward Beecher Recreation Area. These were fairly typical conditions for this part of the trail. Peeper – We found this very noisy little fellow on a tree near our tent. Unfortunately my first picture which showed his throat ballooning out was too over exposed to use. After that, obviously intimidated by our lights and the camera flash he refused to make a sound. We were up early and ventured down to the lakeside to see the sunrise. Fortunately the water was still very warm as I had to wade in up to my waist to get these pictures of two fishermen who were quietly trolling the lake. Ginger booked us this very nice campsite in the Big Bay public use area on Table Rock Lake. The area was very clean the facilities good and the views from the lake shore magnificent. Ginger sat in the shade and read, while I threw lures at non-existent fish, stood up to my chest in the warm water of the lake throwing lures at non-existent fish, and just floated around on the lake. It was a very nice way to spend time on a day when temperatures were in the upper nineties. Super views across Table Rock Lake from the beach of campsite #35. The view towards our campsite from halfway down the hill to the lakeside. We were up early and ventured down to the lakeside to see the sunrise.